Commercial imaging satellite by the US company Skybox. The satellite produced sub-meter resolution imagery and high-definition video. It could capture up to 90-second video clips at 30 frames per second. The resolution was high enough to view objects like shipping containers while maintaining not tracking human activity. Earth Observation satellite built by Skybox Imaging for Skybox Imaging, USA. Launched 2013 - 2014. Status: Operational 2013. First Launch: 2013-11-21. Last Launch: 2014-07-08. Number: 2 . Gross mass: 90 kg (198 lb). Apogee: 595 km (369 mi). Family: Surveillance. Country: USA. Launch Vehicles: R-7, Dnepr, Soyuz-2-1B. Launch Sites: Baikonur LC31. Skysat 2 - . Mass: 100 kg (220 lb). Nation: USA. Spacecraft: Skysat. USAF Sat Cat: 40072 . COSPAR: 2014-037D. Apogee: 635 km (394 mi). Perigee: 624 km (387 mi). Inclination: 98.40 deg. Period: 97.31 min. Commercial earth optical surveillance satellite by Skybox..
SkySat-4 - . Nation: Europe. Class: Surveillance. Type: Surveillance satellite. Spacecraft: Skysat. USAF Sat Cat: 41773 . COSPAR: 2016-058D. Apogee: 502 km (311 mi). Perigee: 501 km (311 mi). Inclination: 97.40 deg. Arianespace's Vega rocket made its 7th flight from Kourou. The AVUM upper stage made two burns to deploy TerraBella's SkySat 4 to 7 in a 500 km orbit at 0224 UTC, and then two further burns to put PeruSAT-1 in a 677 km orbit at 0326 UTC. The AVUM made a final burn to deorbit itself in the Indian Ocean west of Sumatra. SkySat-5 - . Nation: Europe. Class: Surveillance. Type: Surveillance satellite. Spacecraft: Skysat. USAF Sat Cat: 41774 . COSPAR: 2016-058E. Apogee: 502 km (311 mi). Perigee: 501 km (311 mi). Inclination: 97.40 deg. SkySat-6 - . Nation: Europe. Class: Surveillance. Type: Surveillance satellite. Spacecraft: Skysat. USAF Sat Cat: 41771 . COSPAR: 2016-058B. Apogee: 506 km (314 mi). Perigee: 497 km (308 mi). Inclination: 97.40 deg. SkySat-7 - . Nation: Europe. Class: Surveillance. Type: Surveillance satellite. Spacecraft: Skysat. USAF Sat Cat: 41772 . COSPAR: 2016-058C. 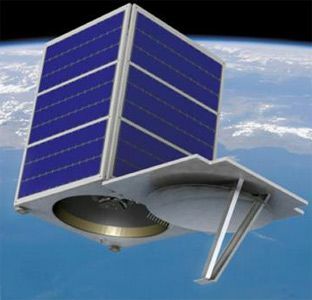 Apogee: 503 km (312 mi). Perigee: 501 km (311 mi). Inclination: 97.40 deg.